Olga Salamanca is Collected Sounds’ Spotlight Artist of the Month for October 2005. Aside from being physically beautiful, Olga has a mesmerizing vocal style. She has a nice lilting quality. It’s haunting. Reminiscent, a little, of Tonya Donnelly of Belly at times. Especially when her voice takes on that almost little girl sound (as on “Blue Sky”) There is also someone else from the late early 90s that I’m being reminded of, but I can’t place it. Mazzy Star perhaps? Yes, I think that’s it. The music is hard to categorize. It’s not really rock, because it’s mellower than that. But it’s not folk because it’s more eclectic than that. She shows a nice use of minor keys and interesting rhythms. It’s kind of psychedelic, swoopy, and very cool. 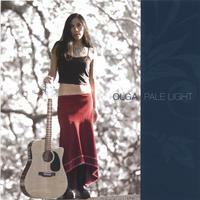 Fans of atmospheric alternative rock will be happy to have stumbled upon Olga and this very impressive debut CD.